Eggs are a daily thing around here. Lately, we’ve been on a breakfast sandwich kick which has been a tasty break from the norm. When recently coming up with brunch ideas for the season, I remembered an old favorite. Basically, omelets made in muffin tins. Yum. 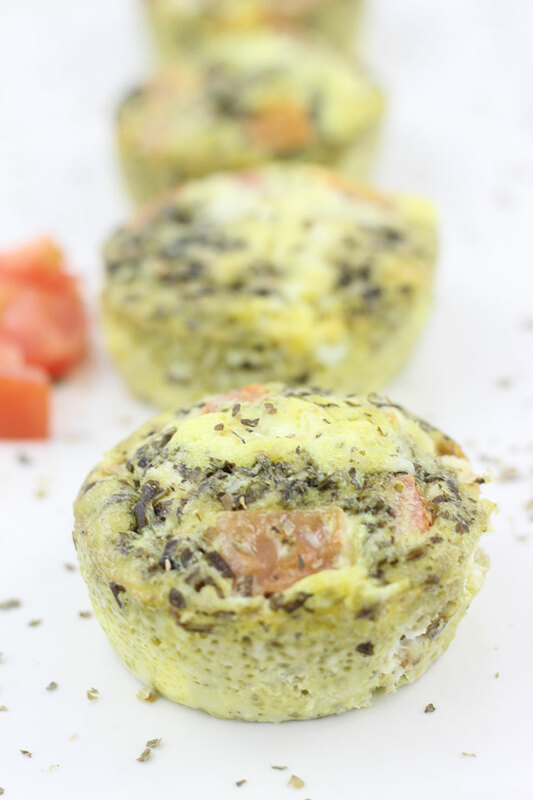 For a fresh kick of flavor, I made these easy Pesto Omelet Cups. This is a sponsored post about Eggland’s Best, all opinions are my own. To make the best egg dishes, I’ve been buying Eggland’s Best for years. There’s something about those beautiful white eggs with the official stamp of approval that helps me feel good about whipping up breakfast. More than that, their eggs have a long list of added benefits like more vitamin D, Omega-3s, vitamin E and vitamin B12 than ordinary eggs. Plus with 25% less saturated fat, there are plenty of reasons to love them. 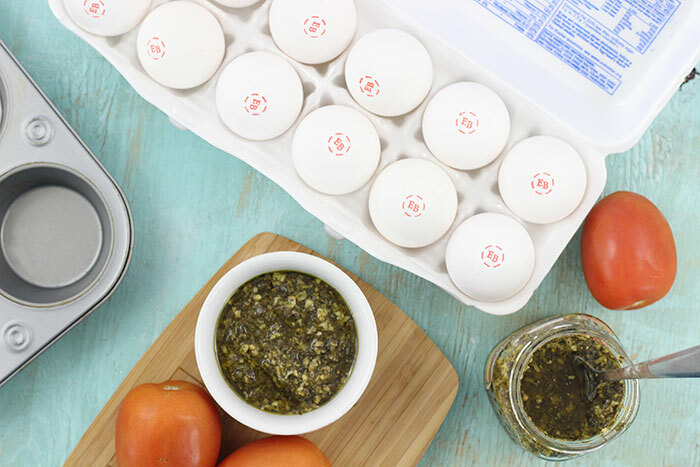 To whip up these simple Pesto Omelet Cups, you only need a handful of simple ingredients and of course, a muffin tin. The beauty of this simple recipe is that you can customize it so easily. Swap out and add any veggies you like. It’s almost guaranteed to be perfect. 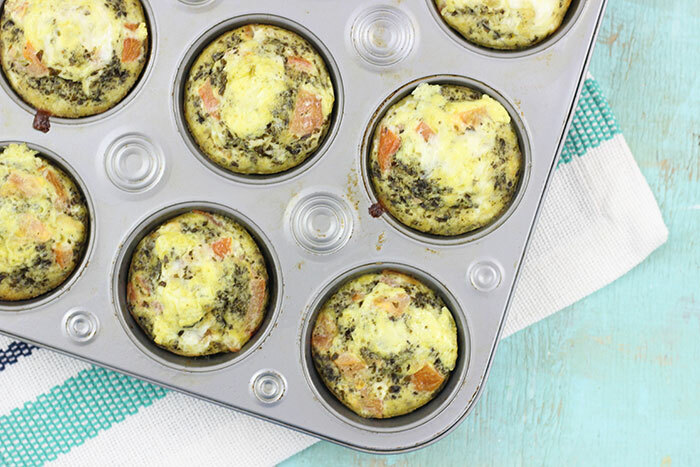 Just don’t fill the muffin tin too high because the eggs do puff up a bit during the baking process. These bake up pretty quick, so you’ll have an amazing breakfast in under 20 minutes. That’s a win. Preheat your oven to 375°. Spray a standard muffin tin with non-stick cooking spray generously. In a large bowl, beat the eggs with milk until blended. Add the remaining ingredients and blend again. Evenly pour mixture into muffin cups. Bake for approximately 16-18 minutes or until the egg is cooked through. Enjoy! Are you a big fan of eggs, too? You’re invited to enter to win some big prizes! How to enter? Visit www.egglandsbest.com/foodtography from now through April 12th, 2017 and submit two mouthwatering foodie photos of your dish that includes at least two whole Eggland’s Best eggs into one of these four categories: Brunch, Appetizer, Main course, and Dessert. You may submit up to two photos in each of the four categories. Best of luck! Now, a little treat for my egg loving friends! PRIZE: One winner will receive a $25 Visa gift card and one (1) coupon, valid for a free carton of Eggland’s Best eggs. Answer this question: What is your favorite egg recipe to make? Leave your comment below to be entered. My favorite egg recipe is a breakfast casserole with ham, cheese and eggs. Yum! I scramble eggs, add spinach as its cooking then top with avocado. I love making omelets. There are so many different ways to make them, different things to add. Our family favorite egg recipes are the Southwestern Omelet, and Huevos Rancheros !!! I like to make eggs in a basket. I love making potato pancakes or eggs benedict. YUMMY! My favorite is a loaded omelette. American cheese, mushrooms, onions, green pepper, bacon! The more loaded the better. My favorite is eggs with fried hashbrowns and melted mozzarella.. But I'm dying to try the pesto eggs! 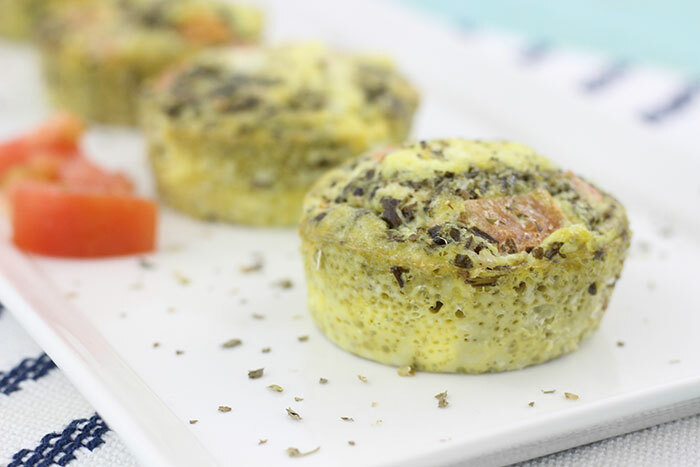 My favorite thing to do with eggs is little mini egg muffins for the morning. I like to add red pepper and spinach on some batches and the other cheese and broccoli. I love my eggs in a ham, broccoli and cheese quiche! I love making homemade egg drop soup. I like the main course collection the best. Having breakfast for dinner one night a week is my favorite. I love breakfast casseroles. I like scrambled eggs with cheese. I like just eggs over medium. I like making deviled eggs for get togethers and parties. Thanks for the contest. I love scrambled eggs with a bit of spice and veggies. My favorite egg recipe is breakfast tacos[scrambled eggs with chorizo, onions, peppers, cheese on a corn tortilla with salsa sour cream and guacamole. My favorite is eggs mixed with cheese and ham baked in a casserole pan. Thank you! My fave is scrambled eggs with cheese and peppers mixed in. I like making breakfast burritos with green chili sauce. I'm all for simple so we really like ham and cheese omelets. Thank you! I love quiche. my favorite recipe is Quiche Lorraine with Bacon and swiss cheese. Oh I have to say my favorite to make is omelets! I love how you can make everyone their own...with different toppings! We love making these for dinner too! My personal favorite is sausage, mushrooms, and swiss cheese! Oh yum! I love to make ham, cheese and spinach quiche! My favorite egg recipe is a vegetable frittata. I like making scrambled eggs and add some cheese. My favorite is egg salad on croissants. My favorite way to use eggs is to make Spanish tortilla with potato and egg! My favorite egg recipe is Deviled Eggs. Eggs Benedict have always been my favorite. My favorite egg recipe is Tomato and Cheddar Frittata. My favorite egg recipe is a straciatella soup. You boil some chicken broth and slowly add a beaten egg and some strips of spinach. For a main dish, I like making a veggie frittata. For dessert my cream puffs are a favorite here. My favorite is easy...2 eggs over medium. Juevos Rancheros is my favorite meal with eggs. My favorite is scrambled eggs. I love to add a few pieces of a hot cherry pepper in my scrambled eggs. ASPARAGUS TOMATO AND CHEDDAR FRITTATA is something that is a hit for brunch or any meal. I like eggs for scrambled eggs for a quick dinner after a long day at work and school. My favorite egg recipe is chili rellenos. I'm trying this recipe this weekend XOXO!! I love to use my eggs to make a frittata. My favorite recipe to make with eggs is deviled eggs. I love to mix it up and get excited over the different combinations. We like to make them scrambled and then placed in a tortilla with cheese and bacon. My favorite way to make eggs are a homemade egg McMuffin. They're pretty easy to do and I actually like them for lunch. When I need more protein, I make scotch eggs - hard boiled eggs covered in sausage and baked. I like to make breakfast burritos for dinner with lots of veggies, bacon and cheese! I like egg burritos, eggs,onions, peppers, and maybe ham. I love egg salad sandwiches - I do boiled eggs, mayo, cottage cheese, onion, celery, pepper and salt - I sometimes mix in other spices, just depends on my mood. I also love an omelet loaded with veggies - onions, peppers, spinach, tomatoes, feta. I love eggs Benedict quiche with Canadian bacon and dijon mustard. My favorite is egg burritos. They take too long to make in the morning, so whenever we eat them they are usually for dinner. One of my favorite egg recipes is deviled eggs. We have them at every family get-together. We make ours with hard boiled eggs, mayo and hot dog relish. Thank you! My favorite egg recipe is Deviled Eggs -- hubby and the kids love them! I love using eggs when making egg salad. I love using eggs in spinach and sundried tomato quiche. My favorite would be sausage, egg and potato casserole. Stir together hash browns, sausage, and cheese and pour into a lightly greased 13- x 9-inch baking dish. Then add whisked eggs, milk, and salt. Pour evenly over potato mixture. Bake 350 degrees for 35mins. My favorite egg recipe, is scrambled eggs, with melted cheese, kale and tomato on a wrap. That looks good! My favorite egg recipe is Tomato and Cheddar Frittata. It is so easy to make amd delicious! We also love quiche! I like eggs in my french toast. My favorite egg recipe to make is Sweet Potato Hash. I use onions, garlic, bell pepper, sweet potato, eggs, grape tomatoes, and sometimes feta cheese. I season with salt, pepper, and sage.